The nation’s racial and ethnic minority groups—especially Hispanics—are growing more rapidly than the non-Hispanic white population, fueled by both immigration and births. This trend has been taking place for decades, and one result is the Census Bureau’s announcement today that non-Hispanic whites now account for a minority of births in the U.S. for the first time. The bureau reported that minorities—defined as anyone who is not a single-race non-Hispanic white—made up 50.4% of the nation’s population younger than age 1 on July 1, 2011. Members of minority groups account for 49.7% of children younger than age 5, the bureau said, and for 36.6% of the total population. The findings are included in the bureau’s first set of national population estimates since the 2010 Census, when 49.5% of babies under age 1 were minorities. Hispanics are more than a quarter of the nation’s youngest residents, according to the new population estimates, accounting for 26.3% of the population younger than age 1. Among other major non-Hispanic groups, the share for whites is 49.6%; for blacks, 13.7%; and for Asians 4.4%. The long-term result of these changes among younger age groups is that non-Hispanic whites are projected to become a minority of the population (47%) by 2050, according to Pew Research Center population projections. (Census Bureau projections say the change will occur in 2042). Hispanics, already the nation’s largest minority group, are projected to continue to account for most population growth by that year. Underlying these changes is the rapid growth of minority groups compared with non-Hispanic whites. Results from the 2010 Census showed that racial and ethnic minorities accounted for 91.7% of the nation’s growth since 2000. Most of that increase from 2000 to 2010—56%—was due to Hispanics. Non-Hispanic whites, though still a majority of the nation’s population, accounted for only 8.3% of its growth over the decade. Another important part of the explanation for changing birth patterns is that minority populations are younger than whites, so are more likely to be having and raising children. There are notable differences by race and ethnic group in median age, the age at which half a group is younger and half older. The national median age in 2011 was 37.3. Non-Hispanic whites have the oldest median age, 42.3, in 2011, according to the population estimates. Hispanics have the youngest, 27.6. Non-Hispanic blacks (32.9) and non-Hispanic Asians (35.9) also are younger than whites. Related to their younger age profiles, racial and ethnic minority groups also include a higher share of women in the prime child-bearing ages of 20-34. Fully a quarter (25%) of the nation’s Hispanic women are in this age group, according to the population estimates, compared with fewer than one-in-five non-Hispanic whites (19%). For non-Hispanic blacks and Asians, the share is 22%. Among Hispanics, the total fertility rate is 2.4. For non-Hispanic whites and for non-Hispanic Asians, it is 1.8. 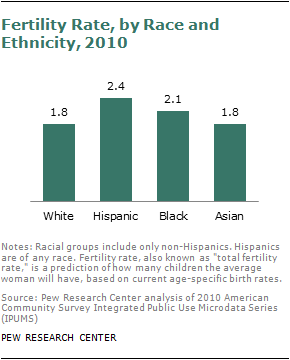 Non-Hispanic blacks (2.1) have higher fertility than whites but lower fertility than Hispanics. Immigration is an important contributor to higher birth rates among Hispanics, because foreign-born women tend to have more children on average than U.S.-born women. Most growth in the Hispanic population from 2000 to 2010 was due to births, not immigration, a change from the long-time pattern. But most births to Hispanic women are to those born outside the U.S.
Social change, not just demographic change, also is driving recent birth rate trends. 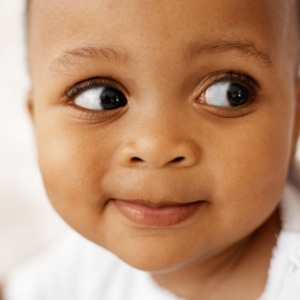 A rising number of multiracial babies is being born to couples that include one white parent. Rising rates of intermarriage explain some of the trend. Among newlyweds in 2010, 9% of whites married someone who was Hispanic or of another race. That was nearly triple the rate in 1980. In a 2009 Pew Research Center survey, 29% of whites said they have an immediate family member or close relative married to someone of a different race; this compares with 50% of nonwhites who said the same. Survey data indicate that the public increasingly accepts and approves of intermarriage and interracial dating. The Census Bureau estimates released today are not the nation’s official birth numbers, which come from the National Center for Health Statistics (NCHS). The latest final NCHS birth data that is available is for 2009. As the Census Bureau explains in its estimates methodology, it calculated the share of births for the nation’s race and ethnic groups based on 2009 data from the NCHS, along with some more current data from individual states. Because there are differences in the race categories used by the NCHS and Census Bureau, the Census Bureau adjusted the NCHS data to be consistent with its own categories. The bureau calculated origin-specific birth rates for 2009 using its own population estimates for that year, then applied them to the estimated 2011 adult population to obtain its results. Although the Census Bureau report does not provide data on demographic characteristics of mothers, a Pew Research Center report based on other data shows that there are marked differences in age, education and marital status among mothers of different racial and ethnic groups. Among black and Hispanic mothers, births peak among women in their early 20s. For white and Asian mothers, births peak among women in their late 20s and early 30s. Looking at educational attainment differences among groups, most white and Asian mothers are college educated, while most Hispanic and black mothers are not. In 2009, according to the National Center for Health Statistics, 41% of births were to unmarried mothers, but the shares varied for different groups: 53% for Hispanics, 29% for non-Hispanic whites and 73% for non-Hispanic blacks.